I love BLT’s…minus the “t” that is. I’m not such a huge tomato fan. But my husband likes them. Every once in awhile I will throw out the suggestion that we should have BLT’s for dinner. Each time my husband wrinkled his nose at the idea, so I’ve never made them. My husband loves grilled cheese. If I suggest it for lunch, or even when we need a quick dinner, he will never turn it down. Since we’ve had lots of fresh tomatoes from our garden recently, I decided to make BLT Grilled Cheese for dinner one night. The result? Huge hit! My husband keeps asking for them. This is definitely going to be a regular in our house. Spread a small amount of butter and mayonnaise on the outside of each bread slice. 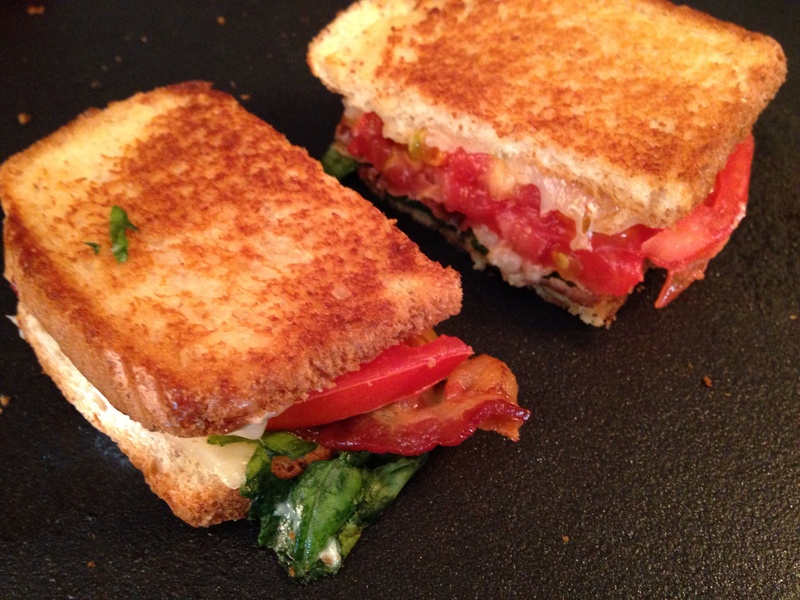 Layer sandwiches with bread slice, cheese, tomato, two slices of bacon (cut in half), a small pile of spinach (it will cook down some) then another slice of cheese. Top with remaining slice of bread. Place sandwiches onto a skillet or griddle. Cook slowly over low heat until each side is slightly brown and the cheese is melted. This entry was posted in Recipes and tagged BLT. Grilled Cheese. Bookmark the permalink.